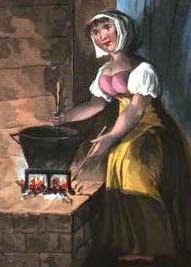 "The cottages in Madeira… consist, generally, of one room, which is subservient to every domestic purpose. 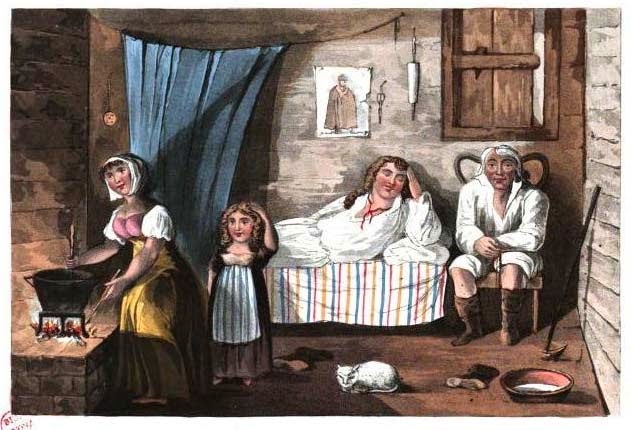 Here the victuals are cooked, and the household occupations pursued during the day; while, at night, it is divided by a curtain or straw mat, to answer the purpose of sleep. Their culinary furniture seems to be confined to a very few articles. 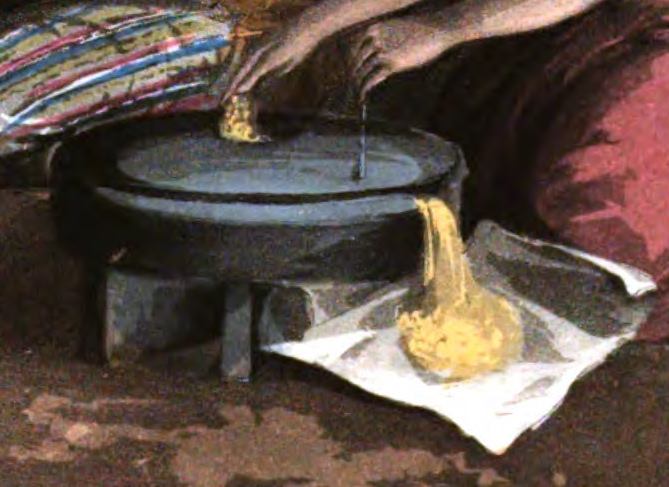 The principal of these is a large iron pot, [on a trivet] in which their food is prepared, which does not offer any abundant variety, as it consists chiefly of a kind of porridge composed of rice and Indian corn. Sometimes indeed, though it is considered as a luxury, not being often seen on the cottage table, the rural people enjoy a meal of salt pork or salted fish. The labour here represented is attached to the grinding of Indian corn, which, though not a native produce, is a chief article of sustenance among the labouring classes. 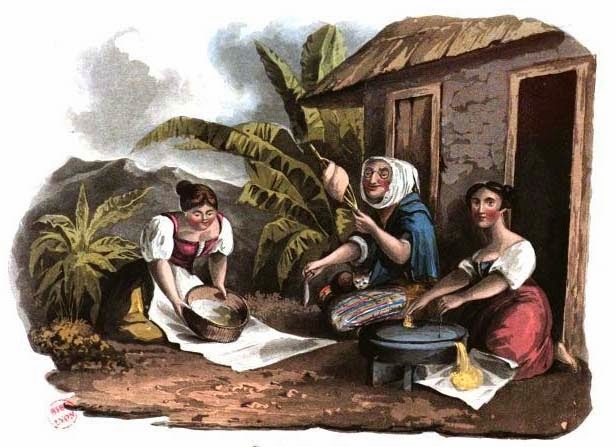 One of the females is grinding the corn by the power of a stone, which the plate fully represents, while the other is employed in sifting it." Quern stones are like miniature mill stones (at grist mills) for use by smaller groups. Grain is put into a hole (which extends through the one stone) and then ground by turning the top stone with a stick inserted into a partial hole. Sets are sold today, and may be seen demonstrated in museums such as Mt. Vernon.